Many innkeepers ask me what the value of membership is to the state bed and breakfast association or other professional associations for that matter. While each bed and breakfast is entirely unique and has completely unique needs, there are some universally common values that every bed and breakfast can gain from these memberships. We just returned from our annual Illinois Bed and Breakfast Association meeting and every time we go are so glad that we did. We always learn something new, have a great time and above all we get a chance to network with other innkeepers. If nothing else, the opportunity to bounce ideas and stories off of one another is invaluable. Innkeeping is a unique profession and no matter how many good friends you have, unless they are also innkeepers, they will never quite understand the specific idiosyncracies that you encounter on a day to day basis. Making innkeeper friends is truly a great and very important value of membership in a professional association. Jeff and Monika help fellow innkeeper Sandy Timmermann with the live auction. Monika is the one behind the cushions. Ongoing education-Webinars, seminars and communication from some of the various vendors these associations work with can make or break your business. Staying up to date, particularly in the marketing arena, is invaluable. Inspections-Most of these organizations require inspections, which mean at least basic minimum standards have to be met. It is a good gauge for you to make sure you are keeping up with the amenities and cleanliness that other bnb’s in the organization have. It’s actually even more important for your guests. Website- Marketing through the association website is not only great for you in terms of future bookings, but a super way to boost your SEO or Search Engine Optimization on your own website. Increase your visibility and you increase your chances of getting more bookings. 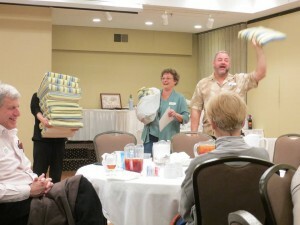 Innkeeper Exchanges-Not all inns participate in this, but those that do, know the value of it. We basically trade out room nights or offer discounted rates to innkeepers in exchange for the same at their properties. This does two things. It gives you the opportunity to try out other bnb’s and maybe get some ideas of things you could do differently and it gives you a chance to reboot so to speak. The number one most important thing about being a good innkeeper is avoiding burn out. Getting an inexpensive getaway at another bnb and having a chance to decompress with other innkeepers is a fantastic way of doing this. Discounts from Vendors-This often happens at the conference but many vendors for things like towels, sheets, toiletries, robes, pillows, etc will offer a discounted rate to association members for their products. It’s a great way to get the things you need at a lower cost. While our unique perspective is as innkeepers, a lot of this applies to a myriad of other professions. Almost every profession has it’s own specific association that you can belong to. Many of them offer the same benefits and additional ones that are catered to that profession. All in all, I would say you almost get what you put in. If you involve yourself, you will invariably get more out of your membership than if you just pay and ignore all that the association has to offer. Participation is key. And pick your battles. You can’t possibly be involved in every association or organization. You’ll membership your way right into bankruptcy. Choose your organizations carefully and ask for referrals from others in your industry whom you have established relationships with. 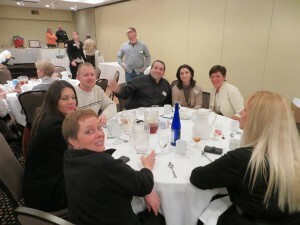 Monika is enjoying a lovely dinner with fellow innkeepers at our annual Illinois Bed and Breakfast Association Meeting.